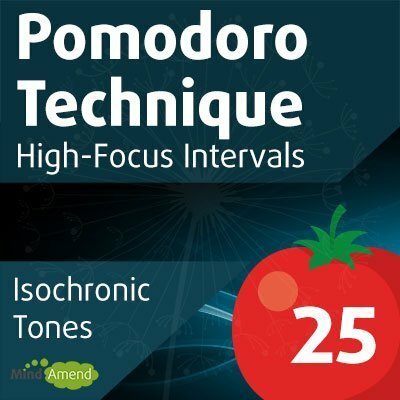 A high focus isochronic tones sessions specifically designed for use with the widely used Pomodoro Technique time management method. The Pomodoro Technique follows a principle of working in short 25-minute sessions, followed by a 5-minute break. Each 25-minute session is referred to as a Pomodoro (Italian for tomato). The technique was coined by Francesco Cirillo in the late 1980s, after the tomato-shaped kitchen timer that Cirillo used as a university student. Use this isochronic tones session as a study aid or to help you complete a task and get things done more quickly and efficiently. The isochronic tones are the repetitive beats you can hear on top of the music throughout the track. The Pomodoro Technique follows the principle of working in short 25-minute sessions, then taking a break before continuing again for another 25-minutes, etc., etc. This enables you to cut out distractions and really hyper-focus and get things done in short bursts. It's recommended that you take a 3-5 minutes break before starting a new session, to help you relax and give your mind a rest. Once you've completed 4 sessions, it's recommended that you take a longer 15-30 minute break. This is an isochronic tone beta wave session which begins at 14Hz and ramps up to 17Hz over 5 minutes, before ramping back down to 14Hz again over the next 5 minutes. The cycle is then repeated until the end. Listen to this track with your eyes open while studying, reading or doing other activities which require a good level of concentration.